I have been breeding and training Papillons for 19 years. My Papillons are huge part of our family living in our home and sleeping on our beds. My breeding dogs have all suggested genetic testing (PRA clear and OFA certified knees) I breed for health and temperament. 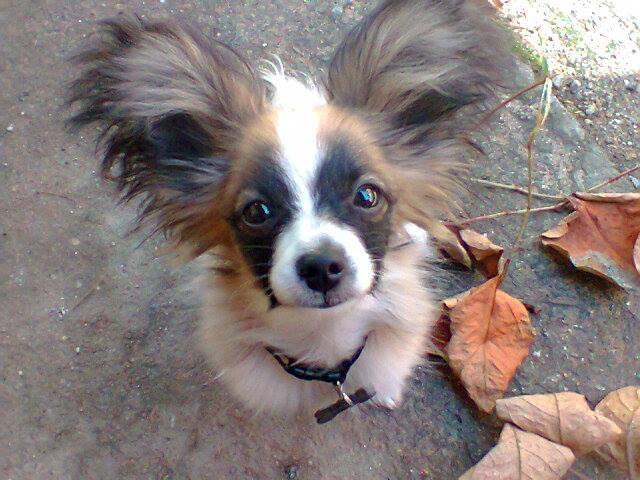 Papillons are wonderful little dogs with awesome dispositions. They are happy go lucky, fun loving little dogs. 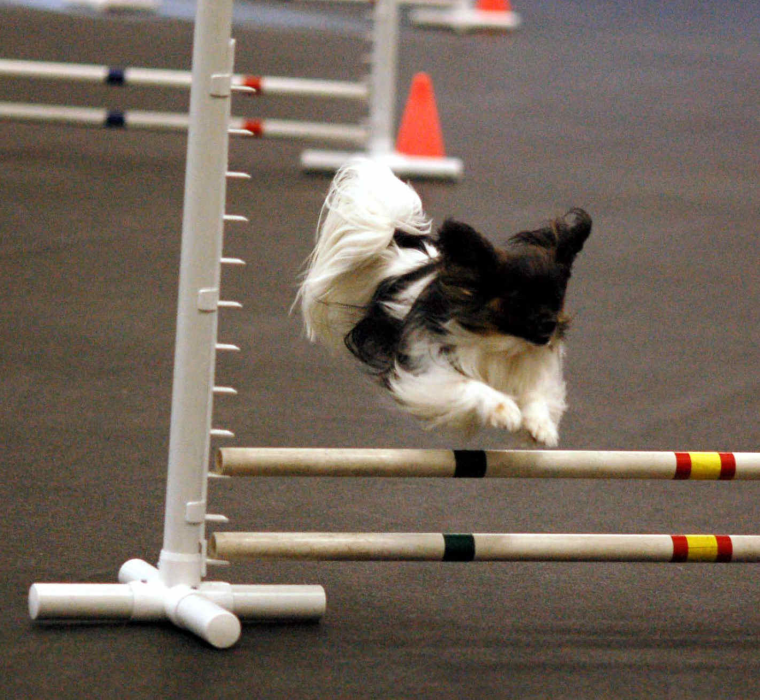 They excel at agility, obedience and as service dogs. They love to please people and are easily trained. All of my pups are sold with AKC registrations, health certificates, health guarantees and a wonderful puppy pack. I am available for the life time of my dogs for questions and advice. I offer grooming and boarding, only for puppies/ dogs that are born in my home. Papillons are very adaptable. They make wonderful family pets although I do not recommend them for families with very young children due to their small size (approximately 2 pounds at 8 weeks) They are also fabulous for elderly and are equally as happy being lap dogs as they are running the agility course. Want to message A Breed Apart Papillons? Send him or her an email by filling out the form below! A Breed Apart Papillons will reach out to you when he or she recieves your message. Marsha - Posted over 1 year ago. 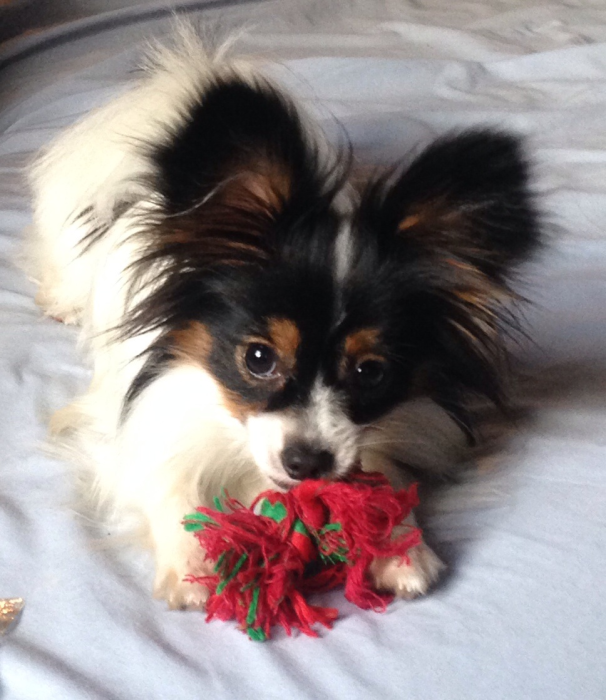 I just recently purchased a beautiful little female Papillon from Kelly. I have had many dogs over the years and I must say, I found Kelly to be superior amongst all of the breeders I have worked with! She is so professional and knowledgeable- there to answer every little question. The temperment of all her dogs is wonderful, and of course, they are all beautiful. I cannot speak highly enough about her breeding practices and feel so very lucky to have found her. Her home is spotless and she clearly adores all her babies.she goes so above and beyond to provide the new parents with everything they need! Feel blessed that I found her! Deborah - Posted almost 2 years ago. It was a very nice experience dealing with Kelly from A Breed Apart Papillons. I am very happy with my puppy. She is everything Kelly said she would be. Beautiful and very affectionate and playful. Dawn - Posted about 2 years ago. Lindsey - Posted about 3 years ago. renee - Posted over 3 years ago. The whole experience finding my new pup was easy and uncomplicated. When we went to pick out beau the set up cleanliness and overall environment was the perfect beginning for a litter and it's mother. Kelly Dudley is very professional and extremely knowledgable I have already recommended her to some friends. We are hoping for papillion cousins! Kriss - Posted over 3 years ago. 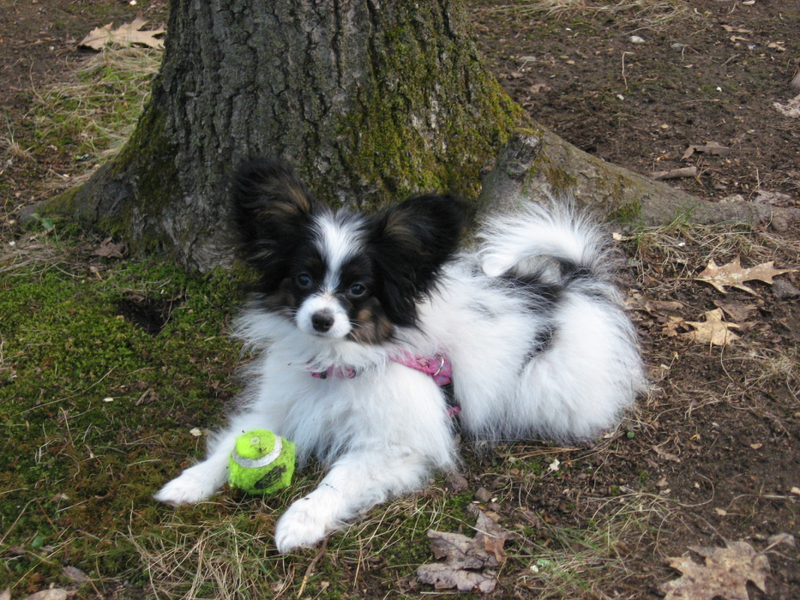 After researching several breeds of dogs and deciding on a Papillon, I contacted Kelly at A Breed Apart. I could tell the love she has for the breed just by my conversations with her. She told me everything I needed to know as a new puppy owner. I have a very healthy and happy 4 month old puppy now thanks to Kelly and the way she cares for her "children" from birth until they're old enough to leave the nest. I have recommended her to several people who are looking for a new pet because I know they will be happy dealing with her and her puppies. Thank you Kelly. Deborah - Posted over 3 years ago. We have had our sweet girl Lupine since August 2015. I was amazed when I went to meet her and bring her home. I knocked on the door, heard a couple of fairly soft barks, then quiet. I was expecting a yappy frenzy. Kelly's pups are so calm and social. Lupine is friendly and outgoing, but relaxed at the same time. I was able to vacuum around her puppy pen and she slept through it. She has adjusted to cats, another dog, and grandchildren. I have has some puppy training questions along the way and Kelly gets back to me right away. 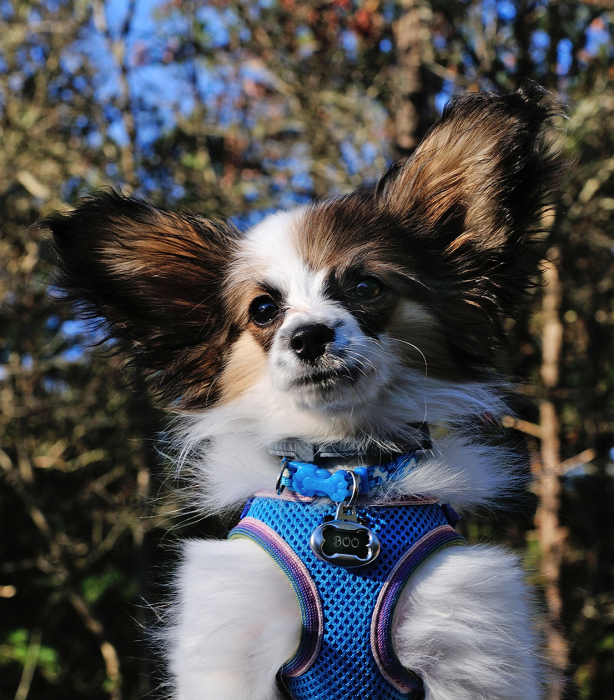 We remain more than satisfied and highly recommend A Breed Apart if you are looking for a papillon. Ashley - Posted over 3 years ago. I gave this breeder 3 out of 5. Eileen - Posted over 3 years ago. A Breed Apart made the adoption experience wonderful from start to finish. Kelly is a true professional, who very clearly loves her dogs and makes sure the match between dog and human is right! She gave us a detailed instruction packet when we picked up our new Papillon and took the time to walk through the information and answer all of our questions. I have no doubt we will be adopting from A Breed Apart in the future. Caroline - Posted almost 4 years ago. A Breed Apart is a wonderful choice to purchase your Pappion from. We purchased Jessabelle about 2 months ago and she has been a wonderful addition to our family. She is very happy, healthy, energetic and gets along very well with children and cats. Kelly is very knowledgeable and has patiently answered all of my questions. I highly recommend Kelly if you are looking for a beautiful Pappion with a wonderful temperament. Laurie - Posted almost 4 years ago. Pamela - Posted almost 4 years ago. May 31st we have our Stevie for 2 years.. We love working with Kelly, we send her pictures of Stevie all the time.. Working with them has been a great experience and when/if I ever want a playmate for Stevie I know where to go.. We are from NYC and Kelly met with my sister that lives in NH to arrange for our little man to have a home.. I would highly recommend them! Simeon - Posted almost 4 years ago. We bought an amazing puppy from Kelly. Masie is 6 month old now, she is beautiful girl with great personalty. All Kelly's papillons are gorgeous, they look so happy and well cared for. Kelly is very responsible breeder. She answered all questions we had and she is available to answer you questions long after you got a puppy. 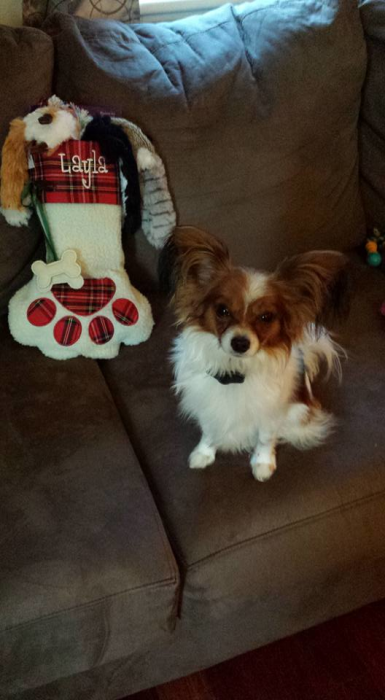 We highly recommend her as a papillion breeder. Thank you Kelly!!!!!!!!! Roseanna - Posted almost 4 years ago. Kelly Dudley the owner of A Breed Apart Papillions is a very caring experienced breeder. Her dogs are part of the family living in her home. When I went there to pick out my pup I was very pleased with what I saw . Her Papillions are well mannered and beautiful. She answered all my questions and gave me information on caring for and raising these adorable little dogs. I also liked the fact that her pups come with health papers and that she is available after you bring the puppy home. If you are looking for a Papillion, I recommend this breeder. Patti - Posted about 4 years ago. 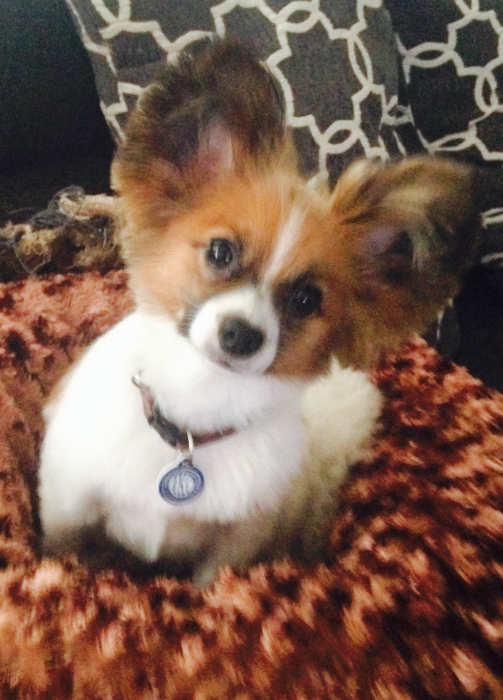 Hello, if you're looking for a papillon breeder Kelly is where you should go. I was so impressed the day I went to pick out which pup I wanted, they really are part of her family, she treats every one of these little angels like they are her own children because they really are. Don't hesitate on getting her pups, they're well bred dogs and you won't be disappointed. My little " La Fille belle" just Belle for short, is the best. Her dad was the very handsome Silenzio's Don Camillo and her mom was the beautiful Fire Cracker. Again, I thank you Kelly for my beautiful baby who's now turning seven this year. Karri - Posted about 4 years ago. We couldn't be happier with Kelly as a breeder. She was professional, helpful, cares deeply about all her pups and was always available for questions before and after we took home our beautiful little Pap. We did a lot of research before picking a breeder and we are so thankful and happy we chose Kelly. Our "Mo" is the sweetest, smart, fun Pap and loves everyone. She gets along great with our other dogs and loves to cuddle with us every chance she gets. We HIGHLY recommend Kelly Dudley! Chris - Posted about 4 years ago. 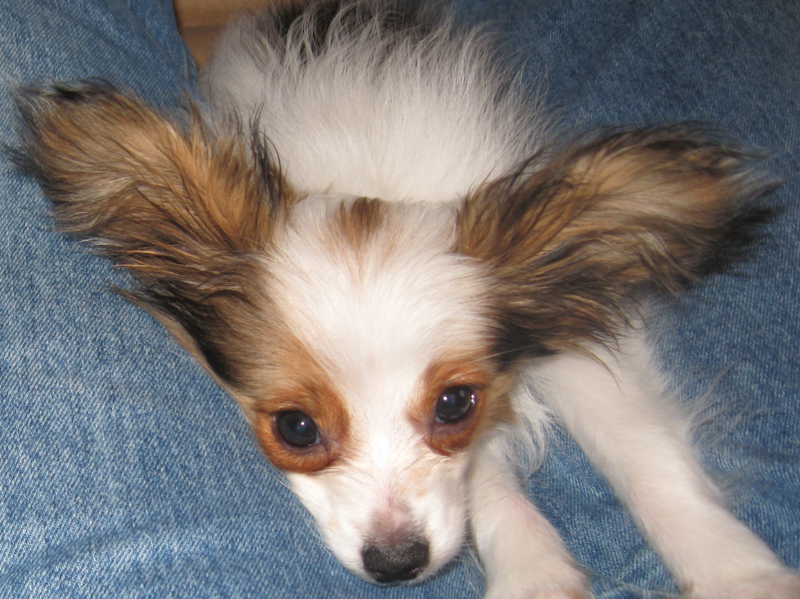 We met kellie for the first time five years ago when we brought our first papillon Shellbee home. 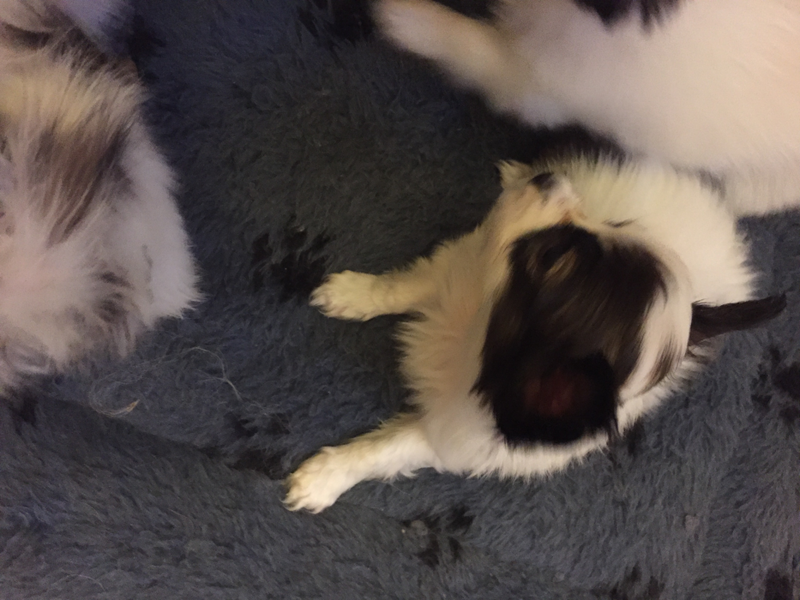 Two short years later we welcome our second papillon myrtle into our home.Now we are looking to add our third one to our family but the only question is do we name her Agnes or Eleanor. The dogs have brought nothing but joy to our family we couldn't have picked a better breeder. Kellie is there for all your needs morning,noon,or night. Kellie-Sue - Posted about 4 years ago. I met Kelly 6 years ago and fell in love with one of her dogs Gizmo. I had heard about Kelly thru my veterinarian. She came highly recommend. All her pups were perfect. I have 2 of Gizmo's pups. They are 1 year apart. Kelly is always there when I need her. She has taken my babies for us when we need doggy care while on vacations. I trust her wholeheartedly. She is such a wonder caring breeder. I couldn't be more blessed. Looking forward to adding to our family. randy - Posted about 4 years ago. Kelly goes above and beyond to make sure her puppies are placed in warm loving homes. I love my Zimba, he is about a year and a half old. He is a perfect fit into our family. Kelly has always been informative and patient with any and all questions. Her puppies are raised in her home. Without hesitation I would recommend A Breed Apart. Sue - Posted about 4 years ago. Tami - Posted about 4 years ago. UPDATE: I wanted to circle back now that a few years have passed since my initial review. My little boy, Tidbit is still happy and healthy at 9 years old. I still reach out to Kelly to say hello as often as I can. 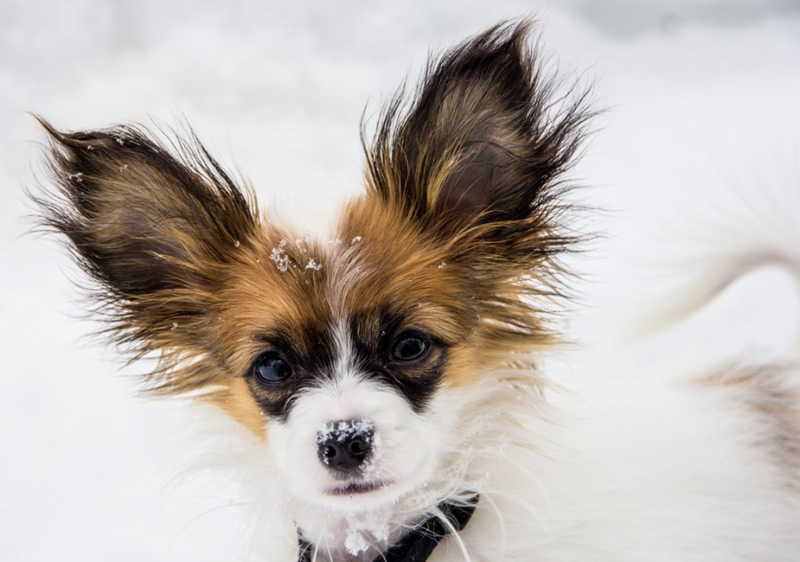 For those just starting their search for a HEALHY and intelligent papillon, A Breed Apart is the way to go! Kelly is an empathetic breeder, who treats her pups with kindness and knowledge. Give her a call and chat with her... she will guide you in your choice and ensure that a Papillon is the right fit for your circumstances. 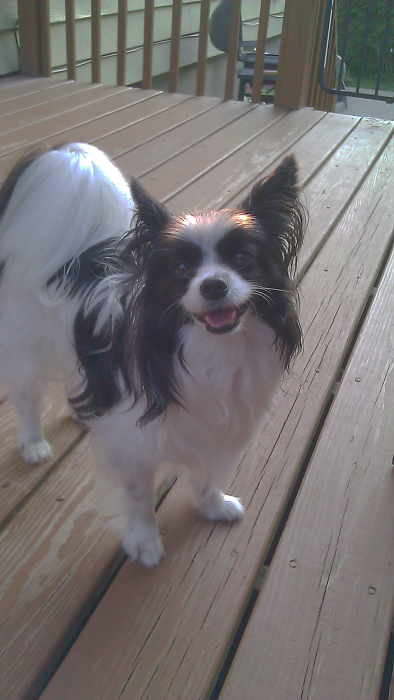 *****INITIAL POST: I am the VERY happy momma to one of Kelly's (A Breed Apart) papillons, who we named Tidbit. A little over six years ago, my husband and I were looking into getting a small dog. It was our first venture into pet ownership. I came across Kelly's site and gave her a call. A few weeks later we were warmly welcomed into her home and got to meet not only her pups, but her family as well. She does indeed raise her pups in her kitchen and dining room...they roam freely and safely. Notably, her houes is CLEAN, not a doggy smell to be found. She interviewed us initially over the phone and then again in person., which made us feel that she did have the welfare of the pups in mind. When the time came to return to take our baby home, she answered all questions graceously (we never felt rushed) and we said our tearful goodbyes. She stood at the door and waved to us with tears in her eyes also. We have even returned with Tidbit to visit Kelly and her family and he enjoyed playing with his "siblings". 6.5 years later, we have a happy, healthy pup who is HIGHLY intelligent (we know he understands English!) and loving. 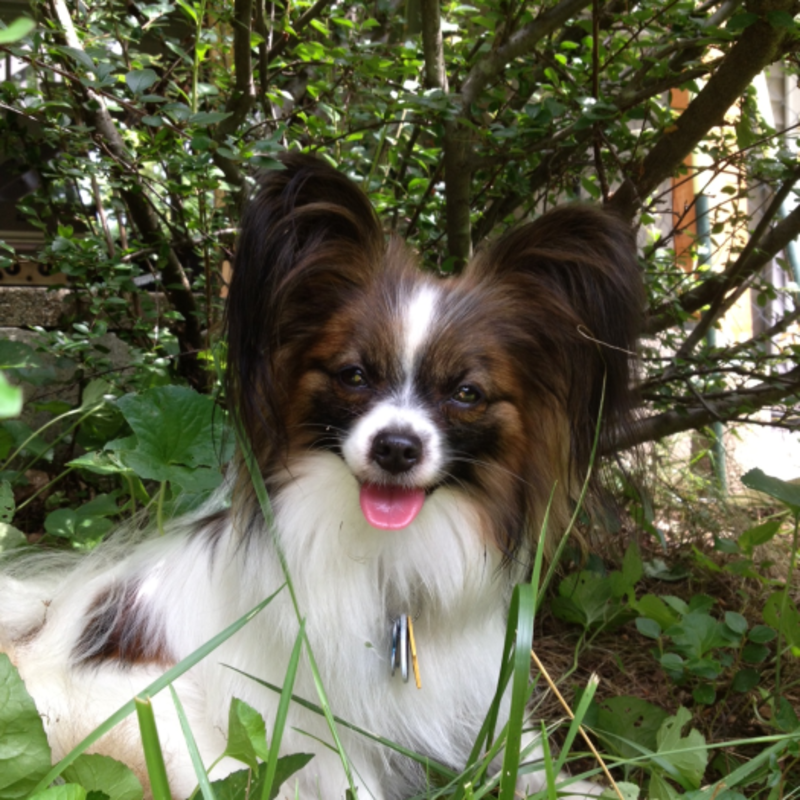 If purchasing from Kelly, you are entering into a loving, extended family of papillon owners. 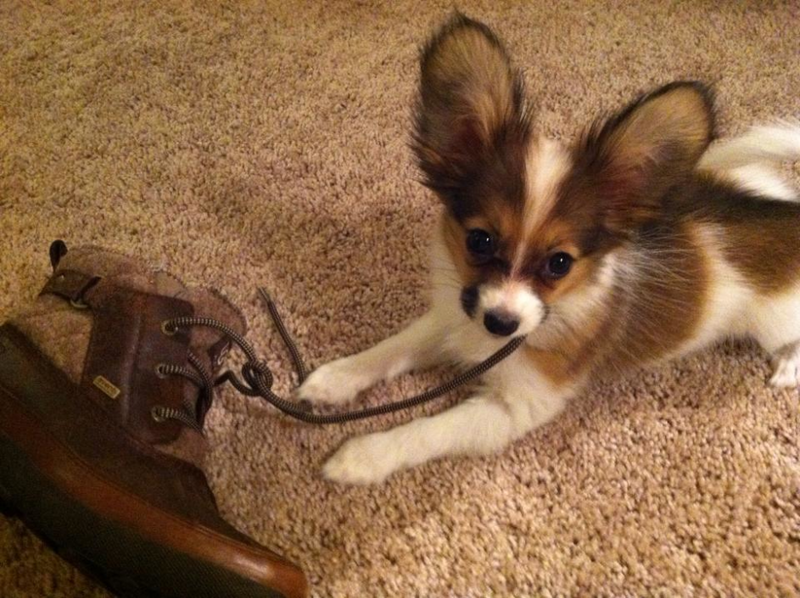 You also may be gaining a "habit"... having a papillon has been likened to potato chips... it's hard to have just one! Jill - Posted about 4 years ago. 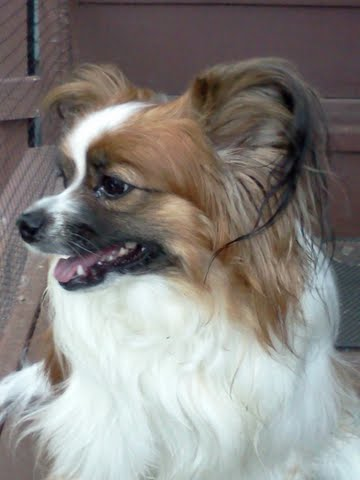 I have a 2 year old Papillon which I acquired from the wonderful breeder Kelly as a puppy. She raises her dogs in her family home with her children playing with all the pups. She is very knowledgeable about the breed, and had no problems answering all of my MANY questions. She still answers my questions to this day when I have them about my Pap. I am so so so happy with my wonderful dog, I wish I could get another little one from her! She has such cute adorable Pap's, raised in a great environment. 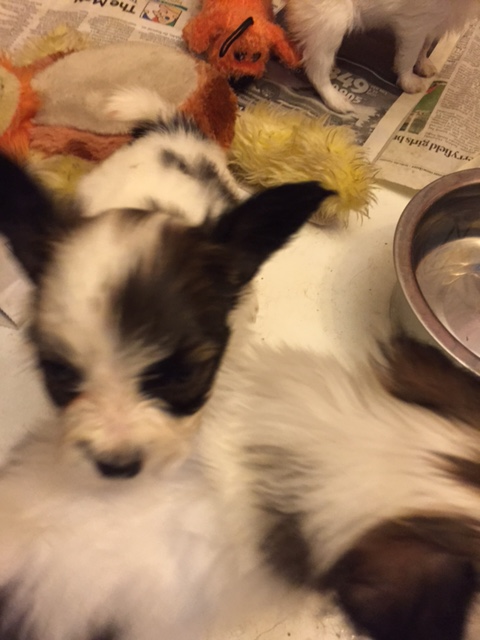 So if you are searching for a Papillon breeder, go no further! This is her! Dawn - Posted about 4 years ago. 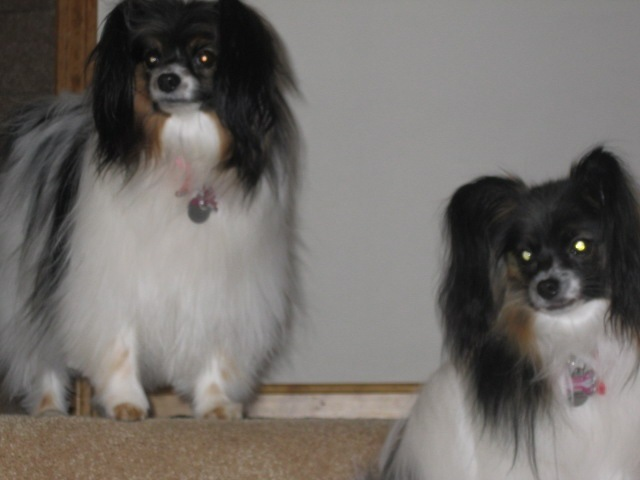 We have two beautiful Papillion's from Kelly, both are sisters from different litters 3 years a part. Bella and Gracie Mae are beautiful/healthy and happy babies who we love like our own children. We spend as much time possible with them when we go on vacations they go with us, we love coming home from work and seeing their beautiful faces looing out the window waiting for us to come in to hug and kiss them :) they are very smart and really so much fun!!!! Thank you Kelly you are the best breeder and we would highly recommend you to anyone. Cindy - Posted about 4 years ago. I have known Kelly for almost 5 years. She raises her dogs in a beautiful clean home. Her dogs eat the best and are treated like members of her family. I had gone thru the devastating loss of my young dog and Kelly invited me into her house and we talked about what would work best for my situation. I adopted an older dog from Kelly and she has been healthy and happy since the day I got her. I often send private emails to Kelly to thank her for my dog, because I feel so blessed that she gave her to me and took the time to find the best friend for me. I would recommend Kelly to anyone who wants a beautiful healthy dog. Peggy - Posted about 4 years ago. I went to Kelly 7 years ago when I fell in love with a papillon that a friend had purchased from her and wanted to get one of my own. 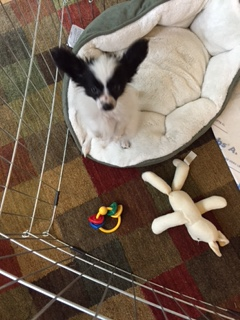 This was to be the first dog dog that I have ever owned and on my initial meeting with Kelly, my husband, two boys and I went to meet her and her papillons. She happily answered my many questions and let us meet all her dogs. I liked that her dogs were well socialized and lived in her house as pets and were not crated. I could not be happier with Tiki. She is friendly, loves people, is outgoing and excels at agility. As an agility dog, she has the rare inner drive because she loves the game so much,which in turn makes it so fun for me as a handler. Due in part to Kelly's breeding and early socializing, Tiki has had no fear of obstacles and is forward and confident in the ring. Kelly has always been available to answer any questions that I had..and I had quite a few when when she was young. I still see Kelly periodically as she dogsits for us when we go away on vacation. I could never leave Tiki in a kennel, so I feel very lucky that Kelly does this for us! 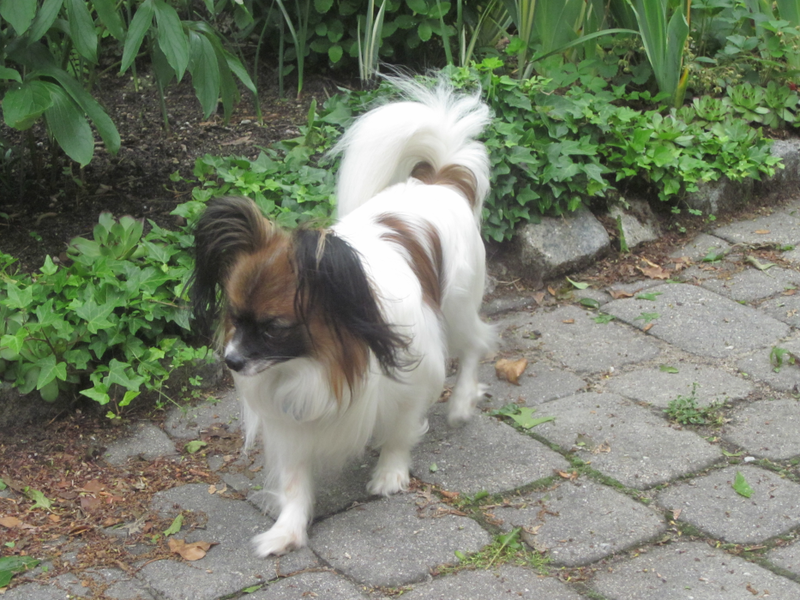 Tiki has had no health issues and when I am ready for another papillon, I will definitely go back to Kelly. Paulette - Posted over 4 years ago. Jeanne - Posted over 4 years ago. I got an adorable female in November from Kelly and absolutely love this breed. A perfect size for an apartment and being mostly indoors for the winter. You can meet the parents before you buy a pup and see for yourself what great dogs these are. Kelly and A Breed Apart have been great so far! Debra - Posted over 4 years ago. Susan - Posted over 4 years ago. Nancy - Posted over 4 years ago. 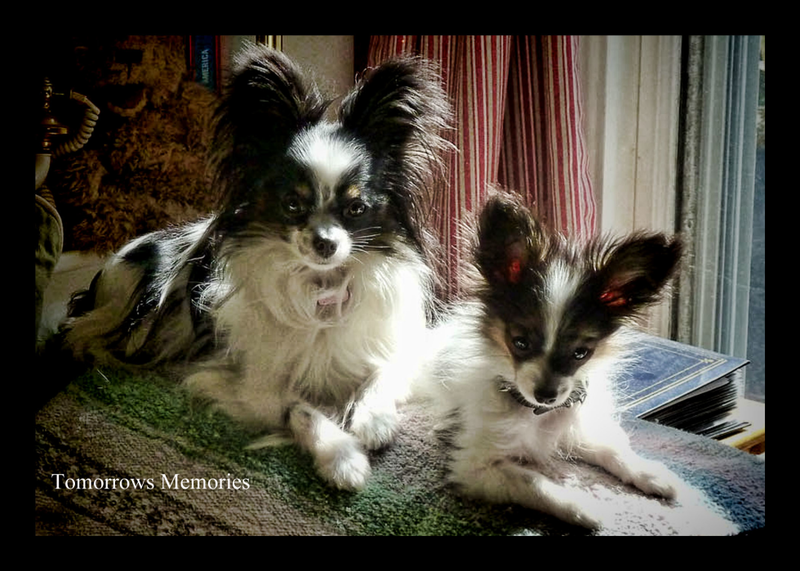 4 yrs ago after losing the second of our last Shelties I started looking for Papillon breeders in the NH/MA area. I visited several of them before visiting A Breed Apart in Londonderry. When I walked into Kelly's home what greeted me was not a room full of Papillons crated, but rather a group of puppies who came to the door to say hello in a very controlled manner! Kelly welcomed us into her home and introduced us to all the humans and furkids as they sat together on the couch watching tv and playing. An important aspect of getting a puppy is getting one that is properly socialized and loved and truly Kelly's puppies are all of that and more. We adopted one female and about a year later adopted another little girl. Both of these little girls came to us well adjusted to humans and other dogs and their personalities are wonderful. It has been almost 4yrs now and we still keep in touch with Kelly. She is always there to answer any questions we might have and to share in our love of our little girls. You won't go wrong getting a puppy from this breeder! Top of the list in my book and I am picky! Tricia - Posted over 4 years ago. 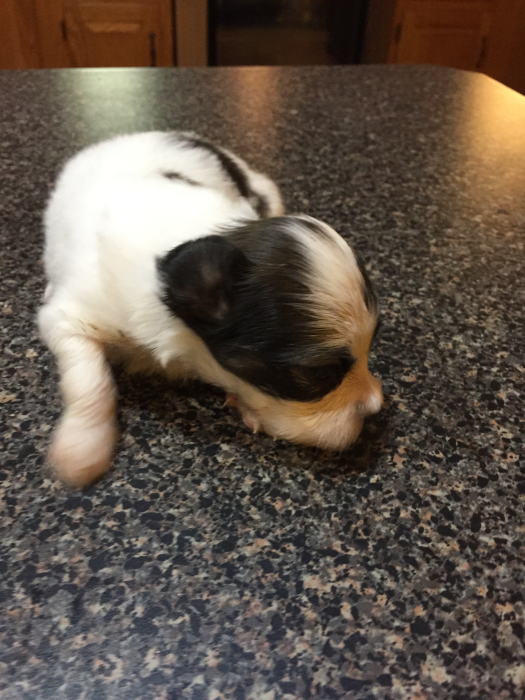 A few years ago I lost my Papillon Gizmo after 16 years and wanted a new baby. I did some research and found A Breed Apart and was able to meet Kelly and her family and all her babies. Kelly had a little girl Papillon, Nala who was 11 months old but was too little to breed and I fell in love with her from the moment I met her. Nala became our new baby girl and has brought so much love to our home. Kelly and her family continue to open their home for our little girl Nala and doggy sit when we vacation and know Nala is well taken care of and is sleeping in bed with Kelly and her family. I would highly recommend Kelly if you are looking for a new baby because she and her family will be a part of your new babies life as if it were her own. Kelly is one of the most caring, loving woman I have ever met and her family is fabulous too! Ellis - Posted over 4 years ago. We purchased Cosmo from Kelly Dudley a year and a half ago and what a dog. He is a great companion, sleeps with us on our bed, sometimes hogs the blankets, travels with us when we go south for a month or so. He goes fishing with us on our boat and travels in the fall when we take our 5th wheel trailer up north to Vermont, New Hampshire and Maine. Although we are both in our 80's we enjoy him all the time. He is a great dog and we are happy to have found Kelly and her brood. Thanks Kelly for giving us a good time dog, Cosmo.